The need to reduce disability and premature deaths from non-communicable diseases (NCDs) is increasingly engaging international organisations and national and sub-national governments. In this book, experts from a range of backgrounds provide insights into the legal implications of regulating tobacco, alcohol and unhealthy foods, all of which are risk factors for NCDs. As individual countries and the international community move to increase targeting of these risk factors, affected industries are turning to national and international law to challenge the resulting regulations. This book explores how the effective regulation of tobacco, alcohol and unhealthy foods can be achieved within the context of international health law, international trade and investment law, international human rights law, international intellectual property law, and domestic laws on constitutional and other matters. Its contributors consider the various tensions that arise in regulating NCD risk factors, as well as offering an original analysis of the relationship between evidence and health regulation. 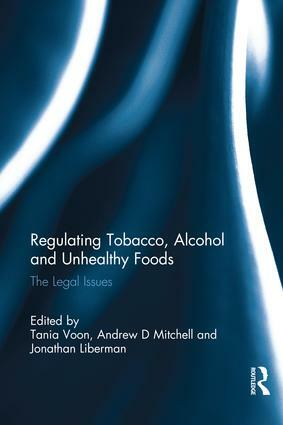 Covering a range of geographical areas, including the Americas, the European Union, Africa and Oceania, the book offers lessons for health and policy practitioners and scholars in navigating the complex legal fields in which the regulation of tobacco, alcohol and unhealthy foods takes place. Tania Voon is Professor at Melbourne Law School and a former Legal Officer of the Appellate Body Secretariat of the World Trade Organization. Andrew Mitchell is Professor at Melbourne Law School and Australian Research Council Future Fellow. Jonathan Liberman is Director of the McCabe Centre for Law and Cancer, a joint initiative of Cancer Council Victoria and the Union for International Cancer Control.